Water Beads are an amazing item for sensory play, they offer some great opportunities for tactile sensory play and can also be used for lots of hands on science activities, but they are not taste safe at all and may not be appropriate for babies or younger toddlers. 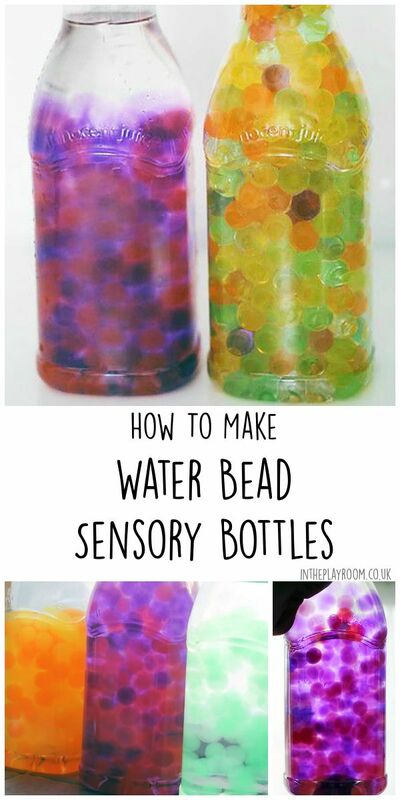 So, if you want to introduce this great sensory play material but have a child who is still tempted to put things in their mouth, or if they have a younger sibling around who may do so then making water beads sensory bottles offers a great baby-safe alternative. Of course, they are lots of fun for older toddlers, preschoolers and even school kids too. I have to admit, even as a grown up I found these so relaxing to use – when you hold them up to the light they are so pretty and sparkle and shine. The pictures don’t do it justice, so you need to try it for yourself! To make water bead sensory bottles, you have a couple of different options. The easiest way is actually to use the empty bottle to hydrate your water beads so that you won’t need to transfer them at all – then it is super quick and easy! Watching the water beads hydrate is also a fun science observation for slightly older kids, as they can watch and observe how the tiny water beads take on the water and grow in size, and change their shape. 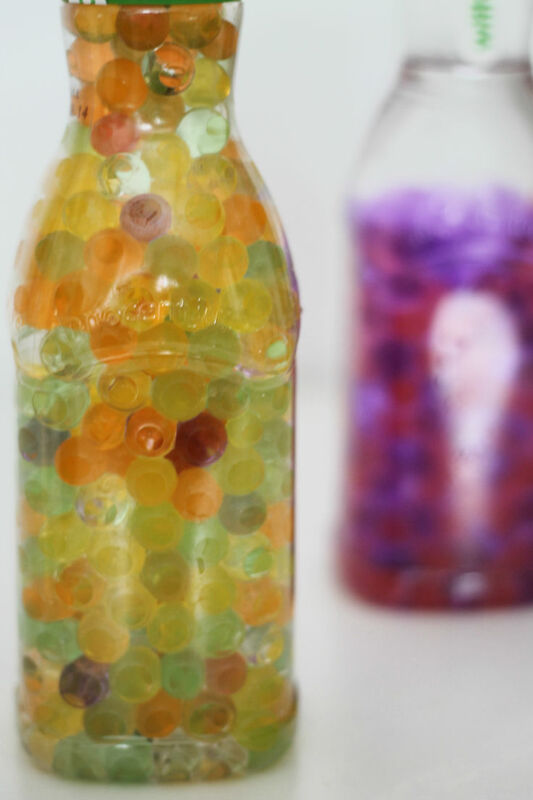 If you have some water beads that have previously been used, you can just place those inside the bottle too (like the one you see on the right in the image above) but I felt that the sensory bottles with freshly made water beads with just a couple of colours did look much nicer. 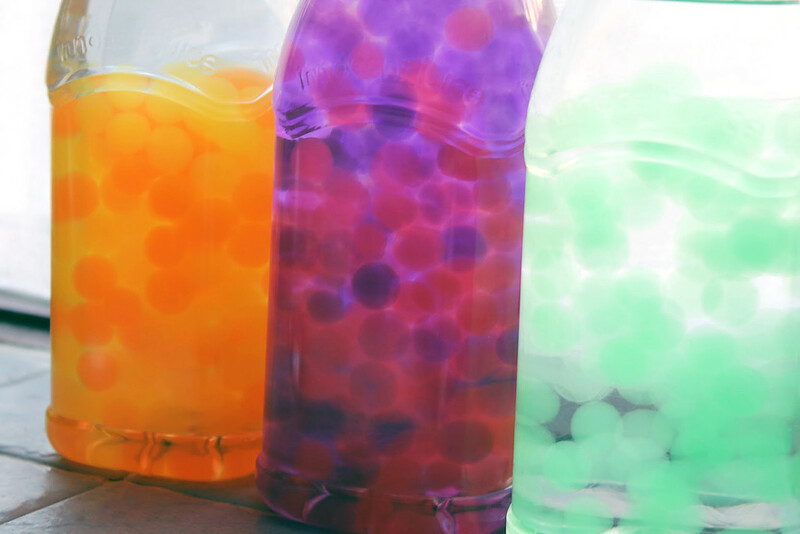 For a floaty effect, where the light will easily shine through, then use a ratio of two packets of water beads in a 1 litre bottle like the empty juice bottles that I used here. Once both packets are fully hydrated inside the bottle, fill up with water to the top and then firmly close the lid. If you are using with babies then you would want to hot glue the lid closed to prevent them opening and getting their hands on the water beads. 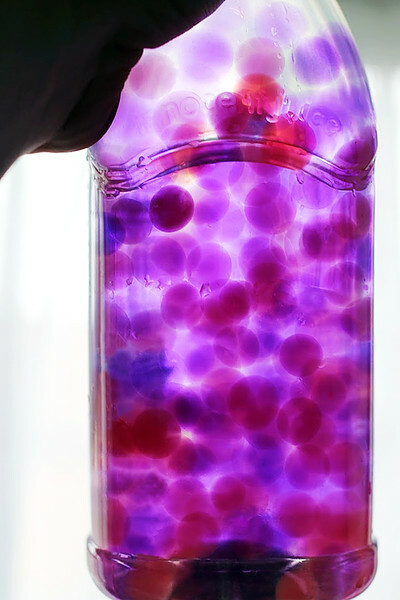 When you move the bottle around, the beads will flow throughout the water giving a great effect. 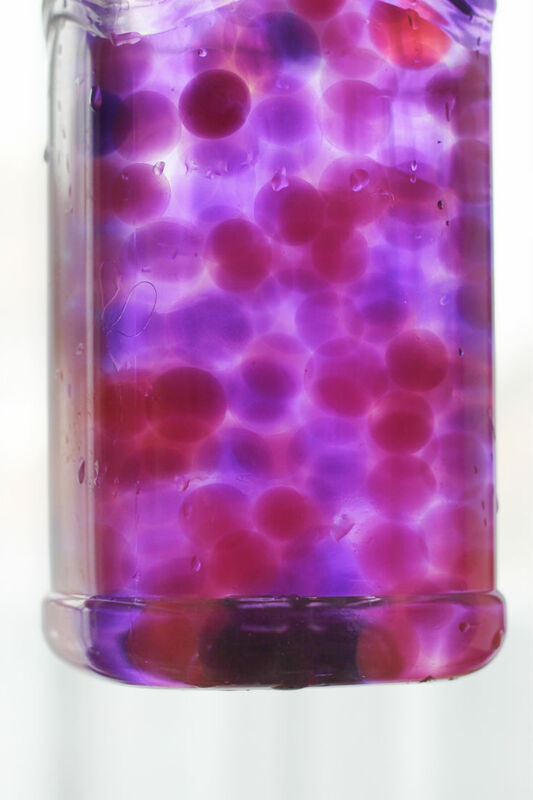 You can see this one shining in the sunlight with pink and purple water beads. The edges of each water bead looks very soft and the shapes don’t look well defined in the water, which gives a really interesting visual effect as the children play and explore with this sensory bottle. As I mentioned before, it does look a lot more effective in person – they were not easy to photograph. Using clear water beads as one of the colours also gives a really interesting effect. They appear invisible in the water, unless you look really really closely. As you can see here the bottle on the right is made up of green and clear water beads. The middle is the pink and purple that I showed above and the end one is yellow and orange which I made for an Autumn feel. This sensory bottles keep well for quite a while, we kept them for a few weeks without the water beads dehydrating or losing any of their shape. Since they are stored inside water, they will be absolutely fine. We also experimented with water bead sensory bottles that were full up right to the top with the water beads. This gives a really different look and feel. There is very little movement with these when they are moved from side to side or shaken, but what you do get is more of that squishy round water bead shape and look and the colours are more separate and defined for children to point out within the bottle. 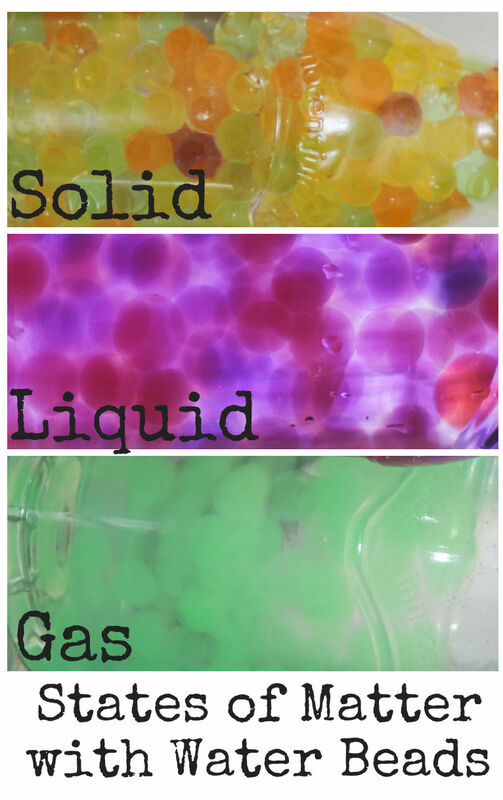 For school aged children, you can use these to demonstrate the particles in solid, liquid and gas. This makes the concept so easy to understand, with a visual representation. The children can really observe how in the solid bottle the water beads can’t move around at all. In the liquid they have a fair bit of movement, but still fill a lot of the space, and for the gas bottle we used the one with the clear beads as the children can see that the coloured water beads are very few and far between but still fill the space, with large gaps in between. It’s a fab easy and quick mess free sensory activity that will last very well to be pulled out on different occasions, offering lots of visual sensory input. If you make some water bead sensory bottles, I would love it if you come share a picture over on the In The Playroom Facebook wall. These look amazing, really love the red/purple one. Never tried water beads but really think I should! Fab! So easy to make! They look good! Such fun! Thanks so much for linking up with us at Mommy Needs a Timeout Thursday! See you this week! We party at 8 pm EST on Wednesday!